Dustin Johnson’s team won the Major Champions Invitational in Orlando. Team members included (l-r) Lauren Stephenson, Grayson Wotnosky, Isabella Britt, Trent Phillips and Anna Morgan. Dustin Johnson has a major championship on his resume and now he has a team that won the first Major Champions Invitational. Sir Nick Faldo had an idea to begin a new upper-level junior tournament. The six-time major champion wanted to have other major champions send teams of Junior golfers to play in a special tournament. Faldo’s good idea and a little arm twisting got 19 major champions to put together teams to play this past week at Bella Collina near Orlando in an event to promote junior golf. 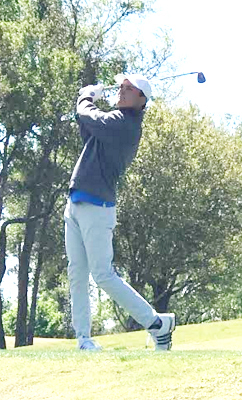 South Carolina junior champion Trent Phillips finished in eight place and helped the Dustin Johnson team win the championship. “This event will allow major champions to give something back to the game that has given them so much, and hopefully, in time, it will become one of the most elite junior golf events in the world,” said Faldo. Country Club of Spartanburg junior director Kevin Britt was asked by Johnson, one of his former students, to put together a team for the tournament. “Dustin put up the $25,000 sponsorship money for the event and we put together a good team to represent DJ and South Carolina,” said Britt. 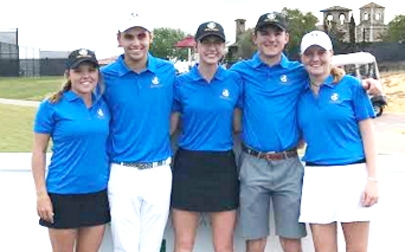 The team was made up of Alabama’s Lauren Stephenson from Lexington, Boiling Springs High School golfers Trent Phillips and Isabella Britt as well as Grayson Wotnosky from the Dustin Johnson golf school and Anna Morgan from Spartanburg. “We ended up taking five players because there was some question if college players could play in the tournament. It turned out they could so we were glad to have Lauren on the team and Anna got to play as an individual,” said Britt. The team competition was scored using three of the four players scores while individual scores were kept for all golfers to crown an individual champion. 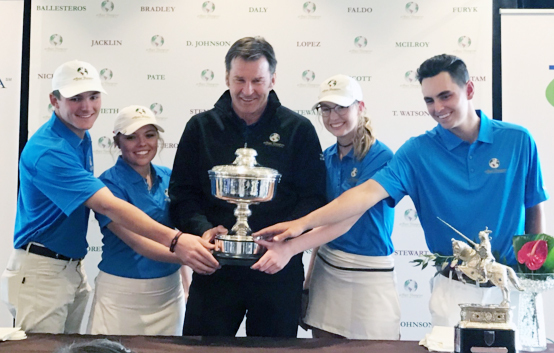 Sir Nick Faldo presents the Dustin Johnson team with the first Major Champions Invitational trophy at Bella Colllina Club near Orlando on March 14th. The Dustin Johnson team led each of the three rounds of the tournament. The team shot a 54 hole total of 19-under par to finish seven shots in front of the team sponsored by Jack Nicklaus. Three of the team’s players finished in the top-10 individually. Wotnoski finished sixth, Phillips finished 8th and Stephenson finished tied for 10th. “It really was a first class event and one that I think is going to grow over the years. They may change the format or the way golfers are selected, but it is something special. We are pretty happy that we were able to win the first one for DJ,” concluded Britt.